We spent a little over a week on The Gili’s. Starting off on Meno we spent lots of time relaxing before moving onto Gili Trawangan with kids. If ever you are dreaming of a tropical paradise, Gili Islands are just that. Deep blue ocean, vividly separated from aqua blue water, and white sand beaches with palm trees. Colourful boats in the bay, everyone is happy and smiley! People sipping on coconuts, street vendors chopping delicious colourful fruits, whilst others are roasting corn on a BBQ! Am I doing a good job of setting the scene here? Life is relatively quiet on the Indonesian Islands. With that comes relaxation and quality family time. Whilst there is not an abundance of ‘child specific’ activities, there are plenty of natural places to play and have fun. Everyone was so friendly, helpful and our little ones really enjoyed themselves. I have a little confession to make. We did something different for ourselves. 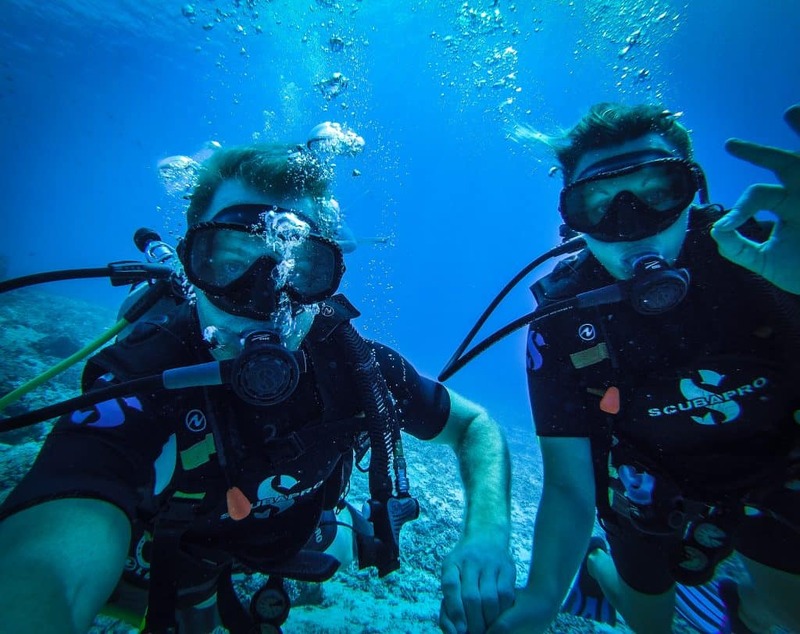 After spending eight months travelling with two small kids, we decided to do our open water diving certification whilst on Gili T. We couldn’t pass the opportunity up when it is one of the best places in the world to learn. Our dive centre kindly helped us out with arranging an amazing babysitter. So in the end we spent two days with the kids exploring and two and a half days diving. 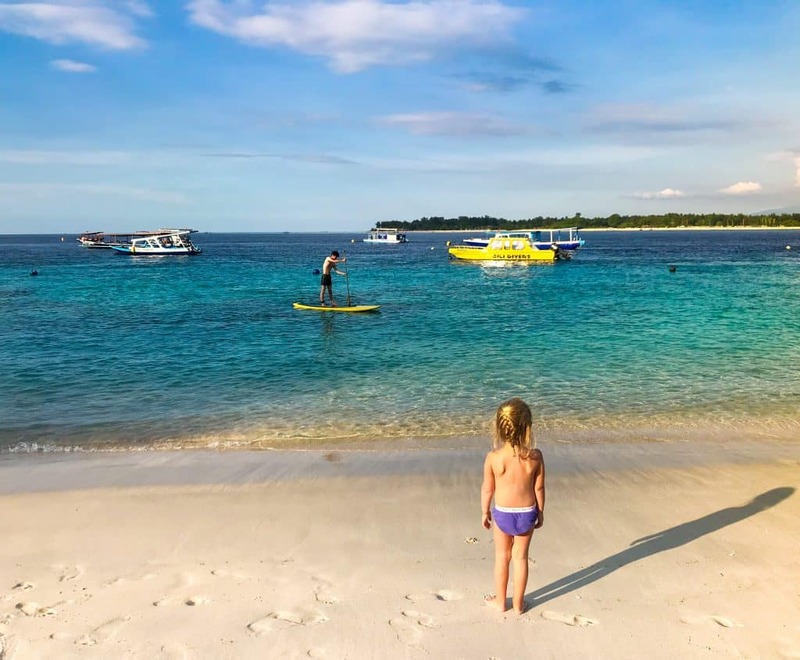 Here is our guide to Gili Trawangan with kids and a little side info about our diving experience. As you may know, there are limited transport options on the island. The choices are a horse and cart, or bicycle. 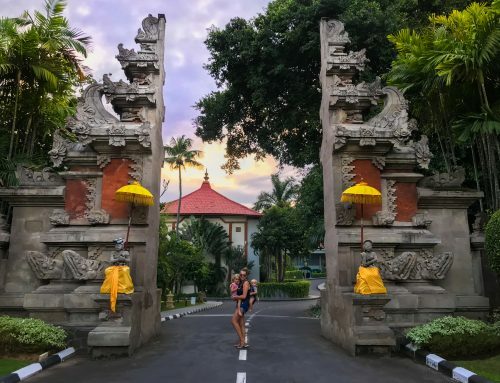 The latter being our preferred choice, it’s such an awesome way to see Gili T. There are so many places you can rent bikes and in some cases, hotels and villa accommodation may provide bikes as part of your stay. We cycled more a less around the island along the beach front. There are some parts where the road becomes sandy, but otherwise it’s a really nice way of seeing things. Of course there is always somewhere to stop by for a cold water or a coconut along the way. Early morning is the best time to explore with little ones. The heat is not so intense, making it more comfortable. We didn’t find any bikes with baby seats, so we had our kids in our carriers that we bring everywhere with us! The water is for the most part, incredibly calm on the beaches in Gili T. There are lots of places where you can rent a kayak or a paddle board. It’s a nice way to spend an hour with little ones. Our daughter who is almost four loved using the paddle and looking into the pristine waters, it was so clear she could see schools of fish just under the surface. If you prefer a more relaxing option, you will see there are many boats with glass bottoms around. 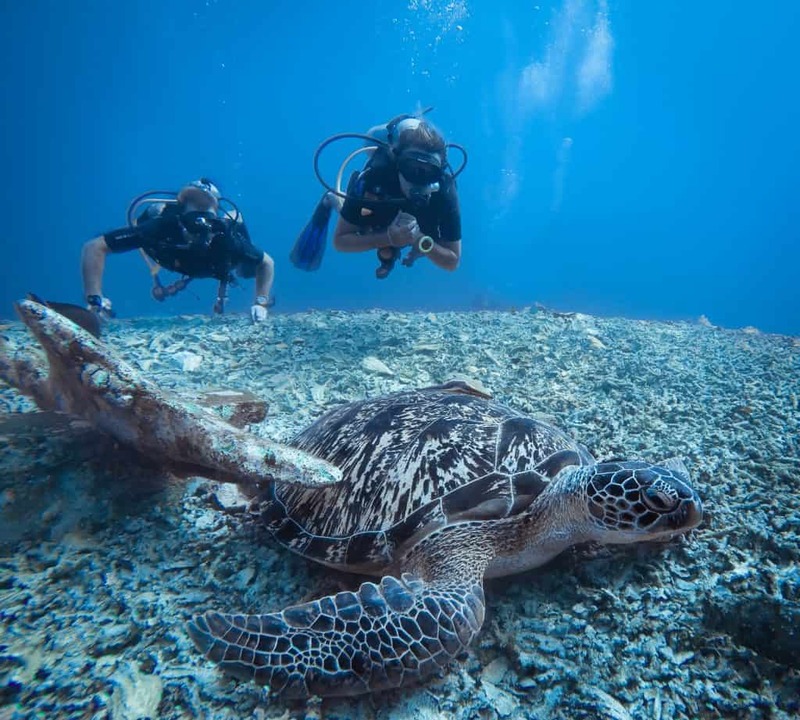 They take guests out for a couple of hours to see turtles, fish and the coral reef. If you prefer you can hop in the water with a snorkel, or look below the surface through the crystal clear glass bottom. Either way, the chances of seeing turtles are pretty high. As long as you move a few hundred metres, left or right of the harbour, all you have is amazing beaches with beautiful water. There are plenty of hang out spots, and I love the fact there is so much shade. We spent most evenings swimming just before sunset. Many of the bars and restaurants have bean bags on the beach with little tables where they serve food and drinks. It was ideal not having to take the kids home to get dressed and washed for dinner. Likewise, Esme could snorkel just off the beach. She was particularly keen knowing mummy and daddy had been diving during the day! Talking of diving, like I mentioned, we spent two and a half days doing our open water certification with Manta Dive. They were simply fantastic with helping sort it all out for us. One of the amazing children instructors, who also happens to be a primary school teacher, helped to look after the kids during the day. She came at 8am every morning and our two little ones loved her. They are both a handful when managing them alone so she was pretty cool to take on the role. Manta Dive are very family orientated as they take kids as young as 8 and teach them how to dive. Esme has a few years before she can do it, but I would love to think we would bring her back to Manta. Being a nomadic family, we have created an adventurous little girl so she was envious that mummy and daddy were diving without her. The course was 2.5 days, from 8am to 4pm. We did a lot of the theory online, followed up with some relaxed conversations with our instructor Julia and consolidated with practical skills. We started off in their special swimming pool before hitting the open water. Of course we were there to learn, but the dives felt so relaxed and carefully planned to ensure we had fun more than anything. We only did our skills at certain points. Otherwise we were seeing all of the marine life that the Gili Islands are so famous for. We saw everything from fully grown sea turtles, to trigger fish, and nemo to butterfly fish. The water was incredibly warm and visibility was immense! I can’t describe how amazing the entire experience was. We found Manta Dive very well organised, professional and all of the equipment was high quality. The mask, the fins, everything! I have to admit we are slightly hooked now, so maybe this will be our little ‘date day’ activity when we are travelling. We stayed in a perfect spot set back a few hundred metres from the harbour. 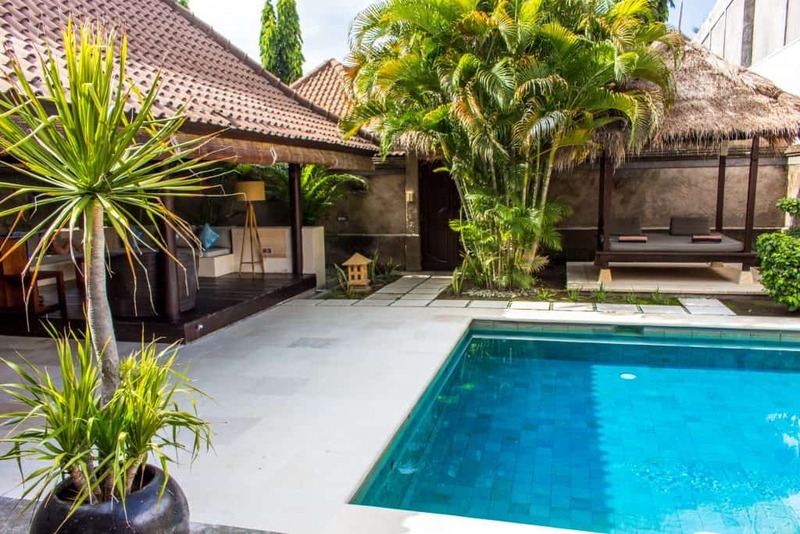 Our family-friendly villa on Gili T was in the heart of the action! There is a reception area on the main street that is staffed 24 hours a day. Just behind reception the entry to the villa winds far back from the street, which gives the property so much privacy. The front door was hiding a fully open plan space. Complete with a graduated swimming pool, several sun loungers, as well as a kitchen. Not to mention the outdoor living room with big cozy sofas and an outdoor TV! We had a massive kitchen with everything you can think of, like a cold filtered water tank which we loved because it meant we didn’t have to buy bottled water and contribute to the huge amount of plastic use in Indonesia. 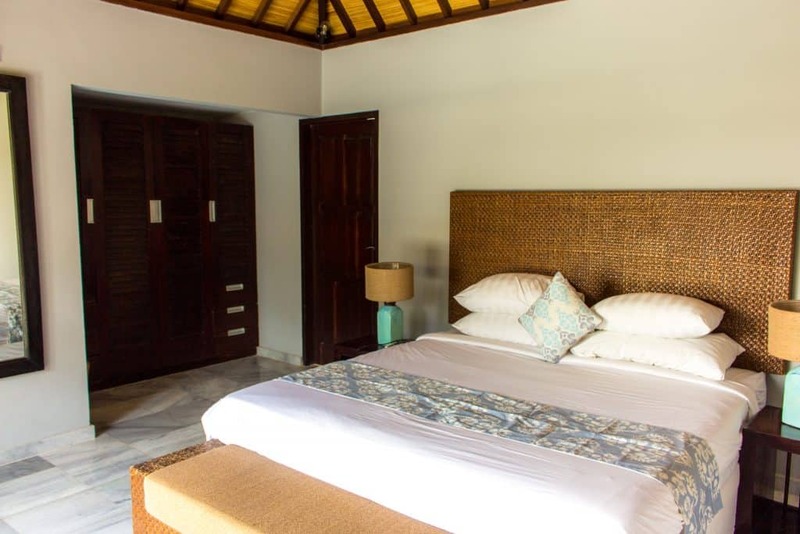 The bedrooms were not open like the other spaces in the villa; they had sliding doors opening out into the swimming pool area, and of course they had AC! The beds were massive in both bedrooms with lots of space for the kids to move around and we had a cot for the baby. I loved the outdoor bathroom, complete with bamboo planting, massive shower space and beautifully designed wall tiles. We spent just as much time having showers as we did in the pool! 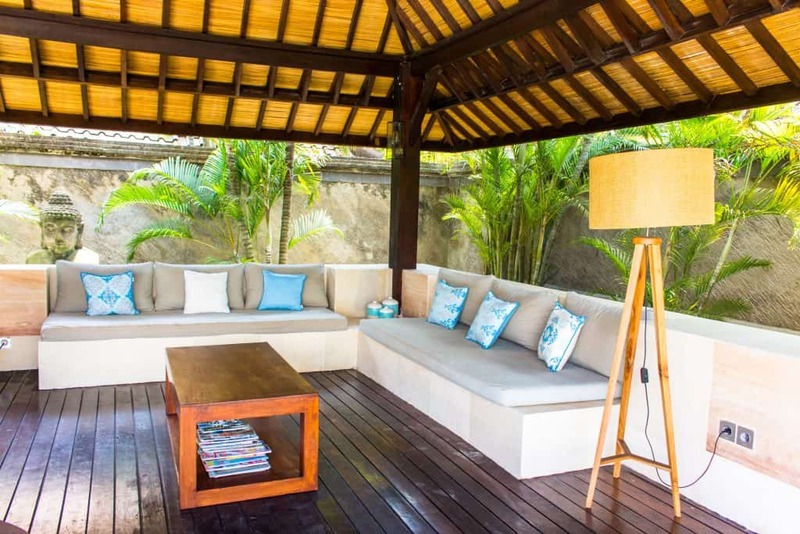 We have stayed at quite a few villas around neighbouring Bali, but Gili Villas have the most unique breakfast. They do not have their own onsite restaurant but the staff come and make breakfast in the villa every morning. We were given a menu the day before, told them what we wanted and a time to come. They were with us at 7:30am flipping pancakes, blending smoothies and popping plates of toast. 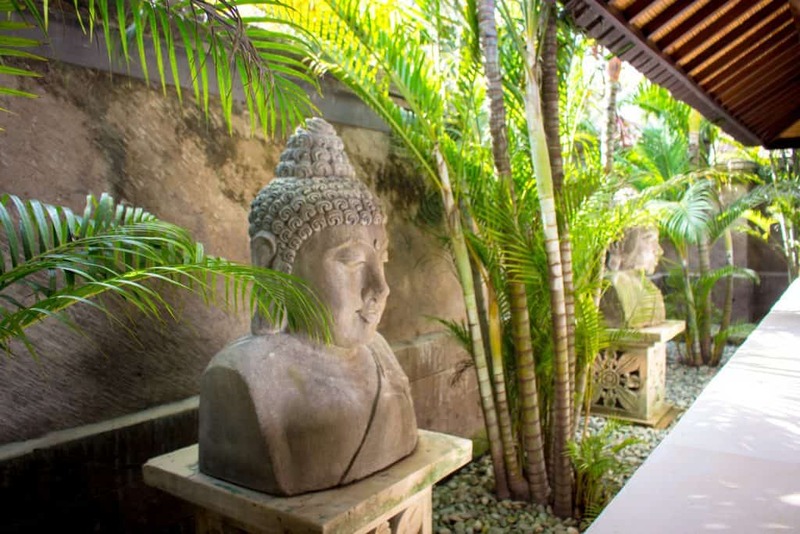 It was perfect for us as we can sometimes be a little slow getting ready in the mornings, but we didn’t have to go to a hotel buffet and the food was great, especially the bowls of freshly chopped tropical fruits. As I mentioned, we were so close to all the action, we generally ate out. We could be at some fabulous restaurants within a second from the front door. It was an ideal location and setup for our little family. 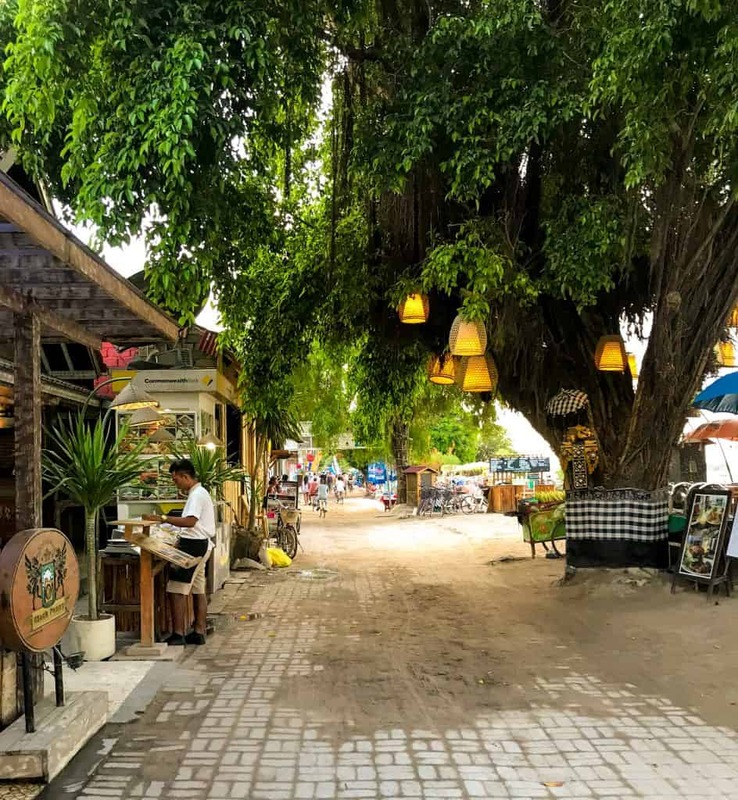 Gili Trawangan has no shortage of amazing restaurants. I was in my element with the array of vegetarian and vegan cafes. I love how so many places are on the healthy band wagon with options that are quite often hard to come by when travelling. Our kids generally love Italian food and asian noodle dishes, smashed avocado and so on. We had no problems finding whatever they wanted. In our family we all eat quite differently so it’s always a win when we can all have something we want. This really good Italian restaurant is quite near the villa. They have many tasty pastas, from carbonara, to pesto spaghetti. Likewise for my husband they had schnitzel with salad and chips. I would describe the food as ‘high quality’ from La Dolce Vita. The pasta was so fresh, you could tell it was freshly made. Our kids hoovered up every last string of spaghetti and it was quite reasonably priced at around 70,000rp per dish. It was definitely our kids’ favourite place to eat. The Kayu cafe is right next to the Reggae Reggae bar and has everything a health conscious eater can imagine. Vegan ice-cream, raw treats, smashed avocado, smoothie bowls bursting with super foods and really good dishes like tempeh Thai salad. The food is great and unlike many other places, it has an indoor air conditioned space to sit down. It was a welcomed break from the intense heat and all round enjoyable meal. This was my personal favourite. 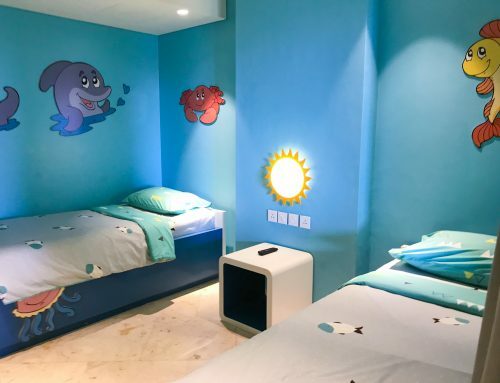 Have you found Gili Trawangan with Kids helpful? Leave a comment, we would love to hear from you. If we’ve helped you in some way, we would love if you could help us too. In this digital age there is a demand for immediate information online. Being a patron is a new-age way of giving a small token of appreciation for this information, which takes time to put together, with no financial return. We offer exclusive access to blog posts before they are published as a thank you. We also offer travel advice and consultancy at different payment tiers. You can sign up to our Patron program here. 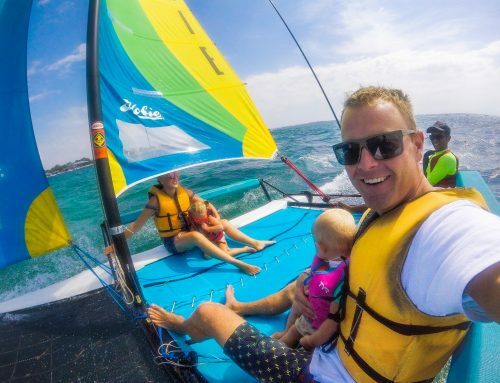 Disclaimer: This post Gili Trawangan with kids has affiliate links. Some of our stay was complimentary in return for an honest review. As always all views expressed are entirely my own. The Gili Islands look like paradise! 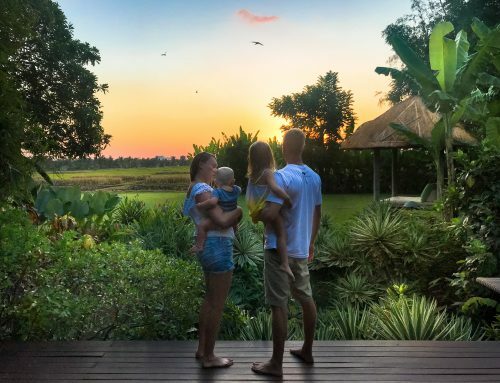 We spent two months in Bali when I was pregnant with my first baby and visited Lembongan but never the Gili Islands. We now want to go back with our children. Which would you recommend for a three year old and six month old? Thanks!